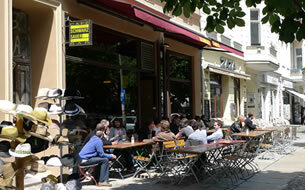 The entire area between the adjacent Helmholtzplatz and Falkplatz neighbourhoods is characterised by the almost uninterrupted block of Wilhelminian buildings and a high density of restaurants, cafes and small trendy shops. 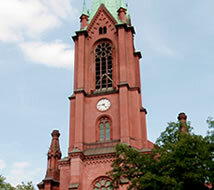 The impressive protestant Gethsemane Church is the most famous church in the Berlin borough of Prenzlauer Berg. 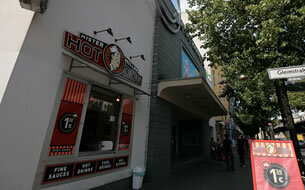 It was built 1891-1893 and is famous for its role in the "peaceful revolution" of autumn 1989. Walk through nearby parks, spend warm evenings in the beer gardens, cafes and bars, and enjoy cuisine from around the world and short journeys to cultural centres. 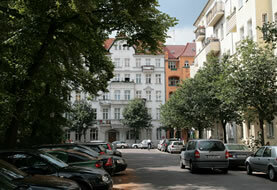 The Schönhauser Allee is one of the most important roads, starting at the Alexanderplatz and running to the gates of the city. 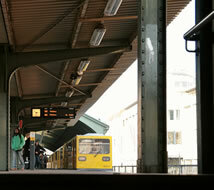 The tram, underground and urban railway (Ringbahn) with stations in the direct vicinity ensure optimum access to local public transport. 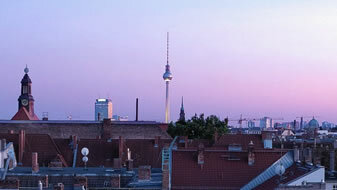 In recent years, one is increasingly discovering more families with big and small children here in the cityscape. The high quality of life and the good childcare possibilities that are traditional to the eastern boroughs present a family friendly atmosphere.